The four photos below show the current side chair and sofa, a conference chair, and a conference table. These pieces show wear and tear, including missing chair spindle and scratched and separated table surface. The furniture has become shabby. The diagram below shows the room shape and several possible configurations of new furniture. The inset picture in the diagram shows the style of chair and table that have been recommended, namely a square table and armless chair. The primary entrance to the room from the main hallway is at the bottom of the diagram at the left. Catalogue views of the new conference chair and lounge sofa are shown below. The lounge furniture is simple in design and should last many years. How Did the Room Originally Come to Exist? 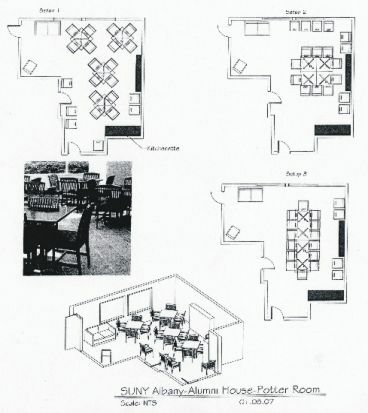 A decade ago five Albany area Pottermen became aware of an available space in Alumni House (then being used for storage). A fund raising campaign was mounted to equip the space as a small group meeting room. The cost of the project was $10,000. Generous donations from Potter Alumni covered the cost. Memorabilia from Edward Potter’s past and from EEPC were located, (e.g., Edward’s photo and the restored Club Emblem) and placed in the room as a fitting tribute to the memory of Edward and the Club. How Can You Help Now? Your donation to the current refurbishing effort can help insure that this memorial will continue to exist and be an attractive part of Alumni House. Any amount you can give will be gratefully accepted. Together we can accomplish the goal. Send you check now to help the cause. Use the form below. What will be done? : Over the years the furniture in the meeting room has become worn, in some cases broken, and, in general, is shabby. The location of the meeting room makes it a prime choice for groups seeking a place to meet at Alumni House. As such, it is in everyone’s interest to have the appearance of the room as pleasant as possible. We propose to replace 18 chairs; 4 tables; lounge sofa and chair; console table; and paint the room. You can see samples of the furniture and the room layout above. What will it cost? : The anticipated total cost is $12,000 at current prices. This total gives us a little hedge. We have no guarantee that the cost of individual items might change by the time purchases would actually occur. How will the work be completed? : The University Alumni Association office will be responsible for the actual work. Our donation will pay the bill for the refurbishing materials. We are assured by the Alumni Association officers that this project will receive immediate high priority attention. What should I give? : Each Potter Club Alum needs to determine what he feels he can afford. While we have no suggested donation amount, we urge you to be as generous as you can. This project is one way we as Alumni can show our Club spirit and express gratitude for the great experiences we enjoyed in the Club, both as undergraduates and now as Potter Alumni. Some individuals or Classes may want to consider making memorial donations in the name of deceased Pottermen. All donations will be recognized by name on a commemorative wall hanging. ☐ I cannot contribute right now, but am willing to pledge $_______________ that is payable within a year. Make donation checks payable to: Potter Club Alumni. Write Refurbishing Project in the memo line.